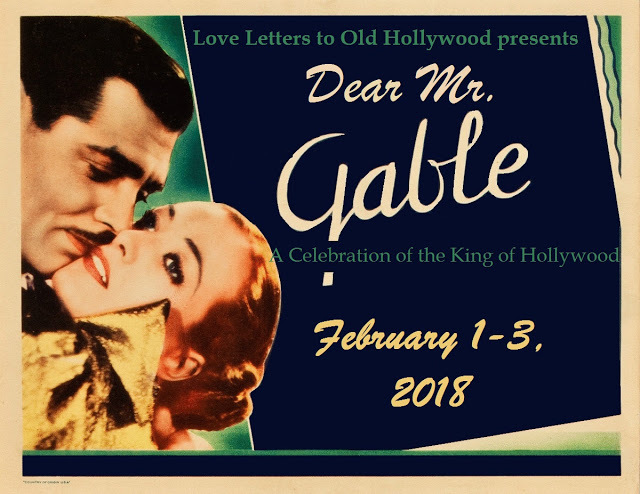 Clark Gable was a heart throb to millions of women back in his heyday. With his iconic mustache and insouciant grin, he charmed his way on the screen in dozens of films. Beginning with a role in a silent film from 1924, White Man, he parlayed his persona into roles over 30 years. Sporting Blood, a movie from 1931, was his first credited starring role, and a short two years later he became a darling of the cinema, winning the Oscar for Best Actor in It Happened One Night. When it came time to film Mutiny on the Bounty, one tragic loss was Gable's mustache. 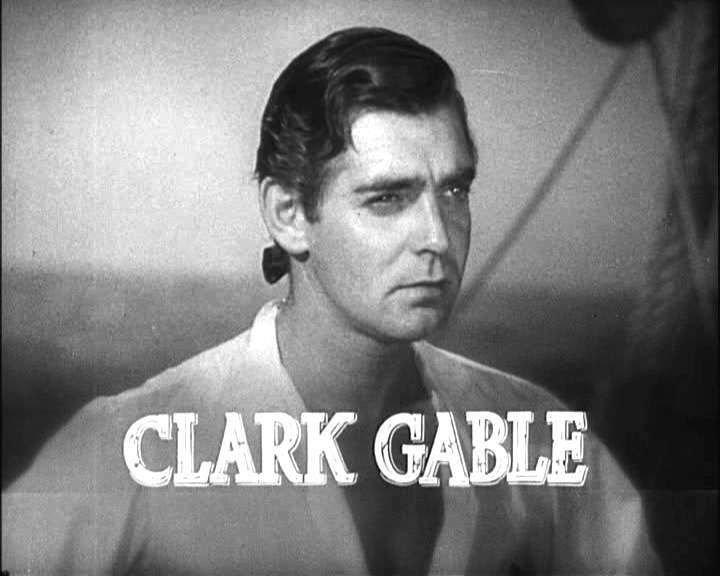 In order to be historically correct, Gable had to shave his mustache since British Naval code forbade their seamen to have facial hair. It almost makes him unrecognizable, though, in my opinion. My first look I was wondering when Gable would appear and then it clicked, that's him in the lead of the press gang! 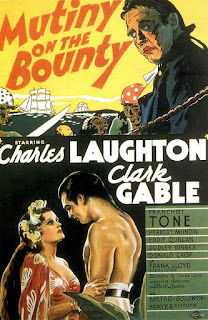 The ship The Bounty is scheduled to sail soon and Fletcher Christian (Clark Gable) and a group of men are roaming the city looking to garner men in a press gang for sailing a trip to Tahiti. The goal of The Bounty is to collect some breadfruit plants to transplant in the West Indies. The food is to be used as cheap food for slaves, although this is never really stated in the movie. After learning that the captain of The Bounty is the notorious Captain Bligh (Charles Laughton), a crew member tries to desert. Bligh is notorious because he is a hard disciplinarian, ordering disciplinary action (flogging) for even the most minor infractions. 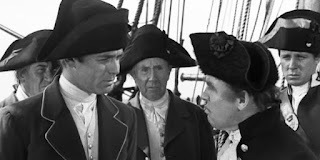 Early on we see how cruel Bligh is when he orders that a man who has been sentenced to be flogged in front of all of His Majesty's ships is flogged in front of The Bounty, despite the fact that the man is already dead from previous floggings. 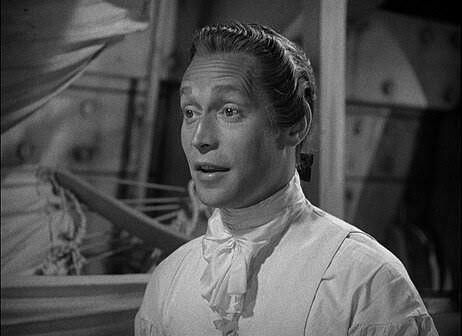 The ship sails with a newly appointed officer, Byam (Franchot Tone), for its destination. 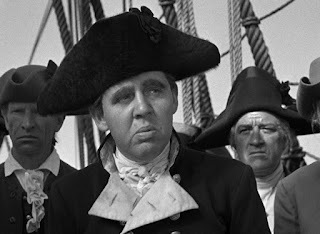 Over the course of the trip Bligh ups the ante numerous times, sending men to the top of the ship in a storm, having several men flogged for such things as disrespect for his command, and just generally being a cad of the worst stripe. Christian gradually comes to dislike his captain, and even goes so far as to defy an order to sign off on an illegal accounting of the stores of the ship. Upon arriving in Tahiti, Byam goes ashore to live with the ruler of Tahiti, Hitihiti (William Bainbridge), to get a record of the Tahitian language. 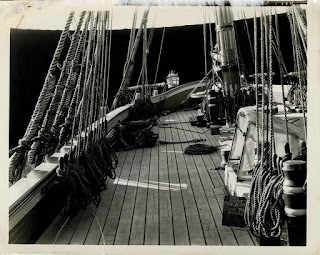 But Bligh refuses to let Christian go ashore. Hitihiti later convinces Bligh to allow Christian a day of shore leave, but Bligh recants on it. Christian, already ashore, refuses to go and arranges that Bligh is told that Christian could not be found. 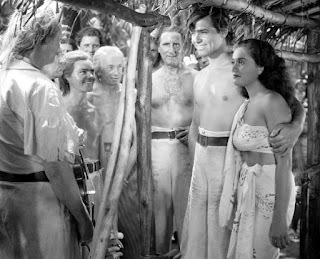 A love interest between Christian and a native serves as an introduction to the eventual decline of Christian's relationship with Bligh. After returning to The Bounty, a few of the seamen are put in irons for a minor infraction (they lost a tub of breadfruit plants, accidentally). After seeing the poor treatment suffered by the prisoners, Christian finally sides with the men and helps in a mutiny. 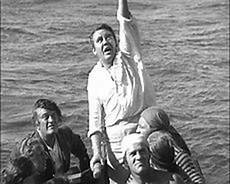 Bligh and his faithful are all set adrift in a boat and Christian takes command of The Bounty. While Bligh and his followers try to get to land, Christian sails The Bounty back to Tahiti, where they take up residence. Bligh manages to get his crew to land, and the authorities send out another ship to re-capture The Bounty. 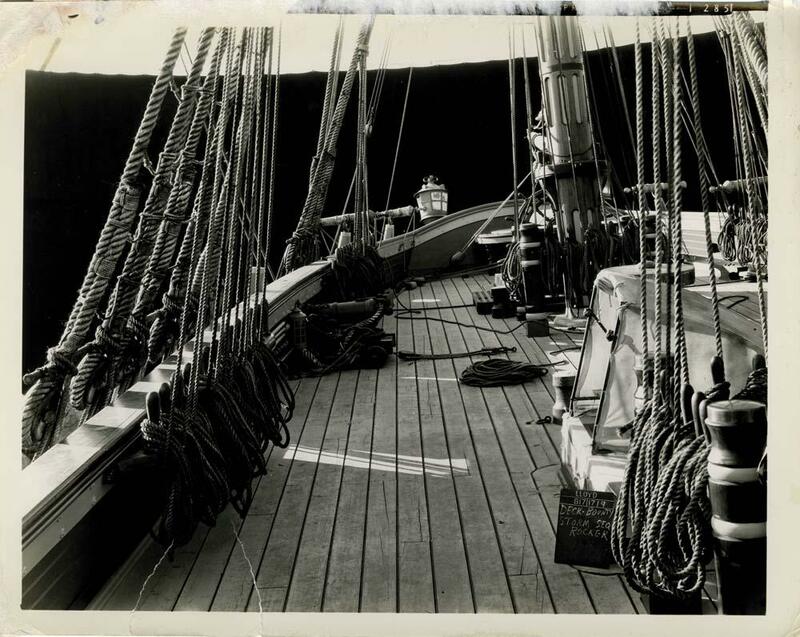 Meanwhile Christian, along with Byam, who had remained dedicated to his captain, but was unable to get aboard the boat have began a new life on Tahiti. But the paradise is soon to be ended as Bligh's new ship is coming to get them. The final reel of the film has Christian re-sailing The Bounty to a safer shore with Bligh in pursuit. And eventually, Byam and a few others who had stayed behind because they were loyal to the Crown and not actually involved in the mutiny end up in the court in England. What happens to both Byam and Christian in the end I will leave for you to watch the movie. Gable, along with Laughton and Tone, was nominated for the Best Actor Oscar, but all three lost to Victor McLaglen in The Informer (a picture which also won the Oscar for Best Director). But the movie won the Oscar for Best Picture, and it is surely worthy of the accolade. As a side note, because of the situation where three actors had been nominated from the same movie, a Best Supporting Actor (and Actress) category was added to the Oscars list. This was the last time (so far) in Oscar history that a film won the Best Picture Oscar, but failed to win any other Oscar. This ends our foray on the sea this time, folks. Be sure to drive home safely, and don't let any irrational captains push you around on the road. The tale of the Bounty certainly has legs (sea legs?). MGM put their considerable best into this telling and paying off with the Best Picture Oscar was certainly its due. Laughton gave such an iconic performance that it is almost easy to overlook the fine work done by his co-stars. None would work as well without the contributions of the other. 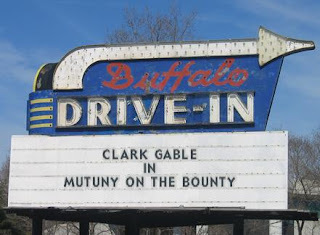 I had only seen Dudley Digges in a rather poor adaptation of The Maltese Falcon. I was surprised he could actually act in this one. He is my favorite of the characters aside from the stars. Thanks for reading. It is hard for me to reconcile the absolute rule a captain of the British navy had over his men. I understand why it is necessary and yet t is so easy and tempting to abuse that authority. The men under command had little or no recourse for abuse as is shown in this film and many others. 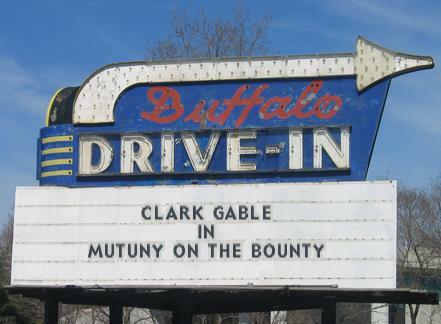 Mutiny on the Bounty is a great film for showing the old saying, "power corrupts, and absolute power corrupts absolutely. It was a different world in the 18th century, I guess. Thanks for reading. Great post! I particularly liked the information about the Oscars. I had no idea this film was the reason for those new categories. It's funny how old Hollywood frequently ignored historical accuracy in its period films, but Gable still had to shave his famous mustache. 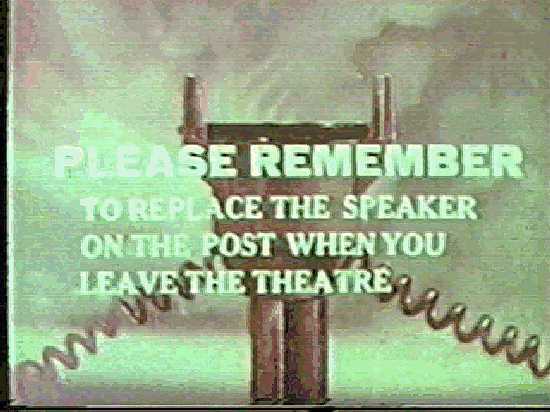 Thanks for joining my blogathon! I read the book when I was a kid, but this is the first movie version I ever watched. Now I want to see the Marlon Brando and Mel Gibson versions. Thanks for reading. I seem to recall that particular fact during my research. Not entirely unprecedented in Hollywood, I'm afraid, but it does help to add realism when it occurs. Thanks for reading. BTW, I nominated you for The Liebster Award :-) Play if you want to! See your post for my comment on the Liebster, and thanks. I don't know how much book presence the character had, so I can't make any comments on that regard. Thanks for reading. This is a really interesting article. I enjoyed reading your thoughts about this movie. I know what you mean about Clark Gable without his mustache. I saw him like that in "Night Nurse" from 1932. I think his looks were definitely improved by the facial hair. By the way, have you decided if you can participate in our upcoming blogathon in honor of Jeanette MacDonald and Nelson Eddy, the Singing Sweethearts Blogathon? Here is the link to the announcement: https://pureentertainmentpreservationsociety.wordpress.com/2017/12/20/ring-the-assembly-bell-here-comes-the-singing-sweethearts-blogathon/. If you are not too busy, we would love to have you participate. We could really use your talent! Thanks for reading. Unfortunately I don't even know if my library has any of the Eddy?MacDonald movies. I know I don't personally have any. But I'm sure I'll be up for one of your future blogathons. Gable was the greatest, with or without mustache! Need to see this one again soon. I'm impressed with it I originally got interested in it because I think Charles Laughton is one of the most underrated actors of his generation, but I stayed for the story. Thanks for reading.